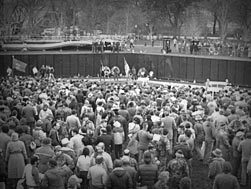 The AVTT Traveling Wall is a 80% replica of the Vietnam Memorial in Washington D.C. The Traveling wall stands 8 feet tall at the center and extends almost 360 feet from end to end. The VFW Ride For Healing is proud to support The Traveling Wall and help raise funds for the Vietnam Education Center. Additional information:- Where was wall constructed? AVTT DESIGNS THE WALLS THAT TRAVEL THE COUNTRY – WE CURRENTLY HAVE TWO. THE ONE APPEARING IN BRAINERD MN AND THE ONE THAT TRAVELS WITH OUR OUTDOOR COST OF FREEDOM TRIBUTE. THE WALL IS DESIGNED IN OUR TEXAS OFFICE (FLINT, TX) BUT THE ACTUAL CONSTRUCTION TAKES PLACE IN MINNESOTA. THE CONSTRUCTION TAKES PLACE IN THE ST. PAUL AREA AND THE ENGRAVING IS DONE BY A FORMER MARINE AND VIETNAM VET OUT OF EDEN PRAIRIE, MN. – Approximately how many appearances it makes per year? CURRENTLY, AVTT ENGAGES OVER 1.6 MILLION AMERICANS ANNUALLY WITH OVER 40 EVENTS OCCURRING EACH YEAR. – How many people travel with the wall? THE AVTT TRAVELING WALL HAS ONE STAFF MEMBER THAT TRAVELS WITH IT. THIS YEAR THAT MAN IS MR. PRESTON FRITZ. – How many people required for sit up and take down? WE REQUIRE 15 ABLE BODIED PEOPLE OVER THE AGE OF 18 TO ASSIST WITH THE SET UP AND TEAR DOWN OF THE WALL.